If our goal is to end the supernatural threat here, we need to destroy every obstacle. The Winchesters, these American hunters, they're no better than the monsters they fail to control! They need to be eliminated. Lady Antonia Bevell was a member of the British Men of Letters who considered American hunters to be a bunch of mindless brutes. Highly set in her own ways, she believed that the American hunters need to be exterminated along with all the monsters in the world since she saw no difference between them. A single mother, she used to have a romantic relationship with Mr. Ketch and she was Dr. Hess' personal favorite operative in observing the activity of American hunters. Mick Davies was sent in to retrieve her and send her back to London while he remained and cleaned up the mess she made, but with Mick's death, Dr. Hess sent her back to America to begin the extermination of every American hunter alongside Mr. Ketch. After being betrayed by Mr. Ketch and locked in the Bunker with Sam and Dean, she decided to help them drive the British Men of Letters out of America, but was later killed by Mr. Ketch, leaving her son an orphan. As the sun begins dying, Lady Antonia Bevell arrives at her home in London, England. Inside she meets with her housekeeper, Anna, who says her son is taking a nap and has her tea ready for her in the next room. As Lady Bevell sits for her tea, she watches the news reports regarding the sun's 6% decrease in energy output. She soon gets a phone call about what is happening to the sun and proceeds to a cellar entrance adorned with the Aquarian Star and descends downstairs into a secret office. As she continues talking, she looks at a large cork board covered with information about the Winchesters, including mug shots, newspaper clippings, family trees, etc. and tells the man on the phones she understands and is on her way before hanging up. Toni enjoying her tea in London. In a bedroom in her house Lady Bevell leans over a sleeping boy, kisses him, and walks downstairs. Anna is waiting by the door with Lady Bevell’s coat and bag. Anna questions how bad things are, and Lady Bevell replies "all the way". Anna then opens Lady Bevell's bag to reveal a gun, telling her it's in case her "mumbo jumbo" doesn't work. When Lady Bevell arrives in the United States, she is greeted by a chauffeur at the airport; she informs him they will he going to Lebanon, Kansas. As Sam and Castiel enter the Bunker Lady Bevell stands out of their line of sight, her hand dripping with blood. As Lady Bevell greets the two, she places her hand on the angel banishing sigil on the wall, causing Cas to disappear. When Sam reaches for his gun, Lady Bevell draws on him and warns him not to draw his gun. She then introduces herself to Sam, stating she is from the Men of Letters' London Chapterhouse. She tells him she was sent to bring him in if the world didn't end, citing his and Dean's past involvement with archangels, Leviathans, and the Darkness. She explains that the "old men" have had enough and that he has done more damage than good due to playing with things he and Dean do not fully understand. As Sam begins protesting Lady Bevell's presence, he starts to walk towards her. Lady Bevell warns him to stop, but he continues walking towards her, telling her to put the gun down. He says she won't pull the trigger, at which point Lady Bevell fires the gun and the shell casing clatters on the floor. Lady Bevell brings Sam, whom she shot in the leg, to Dr. Marion to have his injuries treated, paying him $100,000 to not ask questions. Taking Sam to a farmhouse, Lady Bevell explains that the British Men of Letters have kept Britain safe from monsters since 1965 and they want to do the same with America. To this end, she demands information on all of the hunters in America, including their leadership and how to contact them. When Sam refuses to tell her, Lady Bevell has Ms. Watt torture him for the information, but he refuses to break. 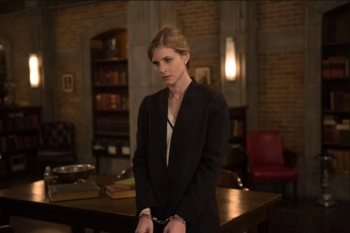 Ms. Watt suggests bringing in Mr. Ketch, which Lady Bevell refuses as she considers the man a psychopath whom she doesn't want to be anywhere near. Instead she decides to resort to mental torture, causing Sam to have hallucinations of people whose deaths he feels responsible for in an attempt to break his mind. When Dean calls her and threatens Lady Bevell if she doesn't turn over Sam, she sends Ms. Watt to kill him. Eventually, Sam apparently commits suicide as a result of his hallucinations, but in actuality he tricks Lady Bevell and briefly overpowers her. Sam nearly escapes but Lady Bevell manages to lock him in the basement once again. Lady Bevell uses a spell and potion to create a hallucination where she seduces Sam to get information from him. She is unable to get much before Sam sees through it, forcing her resume physical torture. As she tortures Sam, Lady Bevell gets a call from Mick Davies informing her that Ms. Watt is dead and he has come to bring her in because she's gone too far. Lady Bevell refuses to stop and captures Dean when he locates the farmhouse with help from Castiel and information on Ms. Watt's cell phone. Lady Bevell threatens to torture Dean instead but before she can begin, a resurrected Mary Winchester threatens her at gunpoint. Lady Bevell and Mary engage in a fight that ends with Lady Bevell cutting open her hand and mentally strangling Mary while Dean threatens her with Mary's gun. Lady Bevell demands the gun, stating Mary will die if she is killed and Dean pretends to comply. As Dean hands over the gun, he punches Lady Bevell unconscious, having recognized that she was using a Chinese mind control technique and that knocking her out would end its effects. The group is then interrupted by Mick who explains that Lady Bevell's orders were to make contact with the Winchesters but she went too far out of her belief of their being a malfeasance in the American hunters. Although the Winchesters want to kill her for everything she attempted to do to them, Mick promises that Lady Bevell will be punished properly in London for her actions and departs with her. Lady Bevell remains steadfast in her desire to get answers, but Mick refuses though he tells her if necessary, he will do what he has to to deal with the situation. To that end, he has called for Mr. Ketch, something that leaves Lady Bevell visibly uneasy. After her fight with Ketch, Mary regains consciousness and asks if he is going to kill her. Mary's phone begins ringing, and Lady Bevell enters and ignores the call from Dean. Telling Mary she's an asset, she sits down with pen and notepad poised and says, "Let's begin." Because of the lack of cooperation with the American hunters, Lady Bevell has been using her equipment to brainwash Mary and use her to target and kill them. She insults her about making a demon deal to save John's life and abandoning her sons ever since she came back. Mary tries to attack her but she is quickly incapacitated by Lady Bevell, who then leaves her cell. She reports on her progress with Mary's rehabilitation to Dr. Hess, who has taken control of the compound. Dr. Hess decides to make either Lady Bevell or Mr. Ketch the new administrators of the American Operation, pitting them against each other like in Kendricks Academy. After seeing Mr. Ketch's newly acquired hellhound, Paige informs Lady Bevell about Sam and Dean's intention to meet another hunter in an abandoned warehouse, which is a ruse to lead her out of hiding. After capturing her, she tells them that Mary had willingly joined the British Men of Letters and attempts to get a rise out of Dean by pointing out that Mary was in a relationship with Mr. Ketch. She also tells them that Mick was killed because of his sentimentality towards the American hunters, who will soon go extinct at Mary's hands. After arriving at the Bunker, they meet Mr. Ketch who had been waiting for them to return. A gunfight ensues with Dean almost killing Ketch, but he is stopped by Mary, whose brainwashing had been completed prior to arrival. As Mr Ketch and Mary leave, Ketch forces Lady Bevell to stay with Sam and Dean as he makes the Bunker go on lockdown, trapping the three of them in the Bunker with only two to three days worth of air left. Lady Bevell being held prisoner by Sam and Dean. Lady Bevell tries to help Sam and Dean find a way to escape the Bunker and tells them that they need her, pointing out that she is the only one who can undo Mary's programming. They try to cast a spell that could reverse the lockdown, but it is ineffective due to a mystical dampener that Ketch had placed in the Bunker's lockdown, rendering it immune to magic. Dean deduces that there is an area in the crow's nest that covers an old sewer pipe which leads outside to the manual override to undo the lockdown. Sam and Dean try to use pickaxes to dig their way through, but Dean decides to use the grenade launcher to finish the job. Lady Bevell calls them lunatics since the explosion could bring the Bunker crashing down, but Dean is able to get through and pull the manual override, freeing Sam and Lady Bevell. Lady Bevell is seen handcuffed in the Impala as Sam and Dean try to warn their fellow hunters about the British Men of Letters' plan to exterminate them. After Jody Mills doesn't pick up, they decide to head over to Sioux Falls, South Dakota, where they find Jody and Alex recovering from a fight, and a tied-up Mary in the corner. Mary points out that Lady Bevell lied about fixing her, using it only as an excuse for them not to kill her. Lady Bevell is forced to point out that Mary's programming is permanent and that the real Mary is imprisoned behind impenetrable psychic walls. She tells them that they have to run or the British Men of Letters will kill them, but Sam points out that they could take the fight to them before they can hurt anyone else. Sam and Jody assemble a team of hunters, including Walt and Roy, to wipe out the British Men of Letters. Dean and Lady Bevell stay behind to find a way to fix Mary, and they decide to send Dean into Mary's subconscious; they return to the Bunker for the supplies for this process. Lady Bevell is killed by Mr. Ketch. After they arrive at the Bunker, they start to get everything they need, but Dean is reluctant to let Lady Bevell out of his sight. She points out that her organization left her to die and that she is on no one's side but her own. She asks Dean to let her go when the dust clears, wanting only a head start and a chance to see her son again. Dean decides to trust her while she gets everything they need to get started. She synchronizes Dean's Delta waves with Mary's, creating a psychic link, and injects them both with hypnotic agents laced with a sedative to help Dean get into the necessary therapeutic dream state. Dean handcuffs Lady Bevell to the table before she injects the syringe's contents into Dean. While Dean is trying to get the real Mary out of her subconscious, Ketch is able to use Paige to track Mary's location to the Bunker. Upon arrival, Ketch slices Lady Bevell's throat, killing her and pulling Dean out of Mary's mind just as he finally gets through to her. However, their efforts are proven to be successful as Dean has reawakened Mary, who kills Ketch and avenges her death. Meanwhile, Sam and the rest of the hunters that went after the British Men of Letters are successful in eradicating them from the United States and destroying their base. This page was last edited on 19 July 2018, at 04:26.